You have the coolest fabric stash! Thanks, Marji. It makes me smile. Can't wait to see what you put together. That Tula Pink fabric is intriguing. Thanks, Anja. I won't blog about it until it's 100% done, but I will be posting pics on Instagram. Just posted my first progress shot. Thanks, Iris. Hindsight, I could have just waited around for someone else to host a Halloween swap, but I'm glad I'm doing it. Lots of work, so not sure if I'll host again. Looking forward to your final product!! Congratulations on hosting your first mini quilt swap. 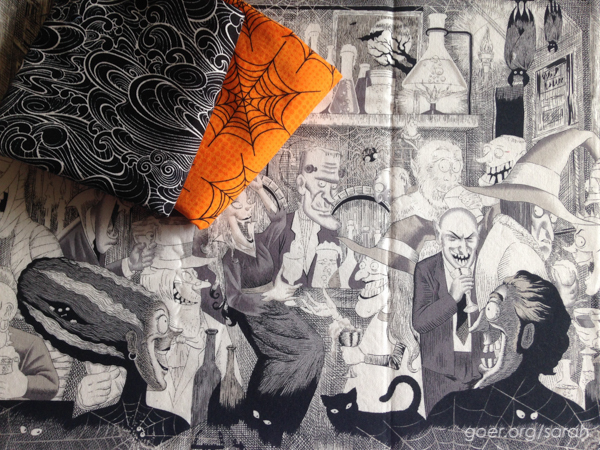 The halloween fabric and theme looks like fun! Thanks, Deb. It's been really fun to see what people have come up with.